AB Commander includes a built-in file splitter that you can use to split a large file into several smaller segments. You may find this command of use, for example, if you have a large file that does not fit on a single floppy disk. You would use the Split command of AB Commander to split the file into smaller segments, each of which would fit on a floppy disk. Later on, you could use the Merge command to combine the segments back into the original file. 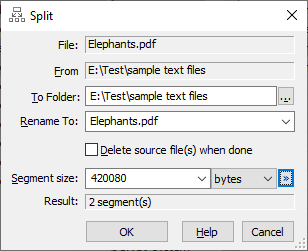 To use the Split command, simply select the file(s) you want to split in one of the panels of AB Commander, and then choose Split command from the Command menu to display the Split window. There, specify the folder where you want the segments to be created, the base name for the segments, the desired size of the segments, and press OK. AB Commander will create the segments in the folder you have specified. If the destination folder is the floppy disk, you will be prompted to insert a new disk for each new segment. Each segment will be numbered consecutively, by appending a three-digit numeric extension to the base name. (For example, if the base name of the file is Letter.doc, the segments will be named Letter.doc.001, Letter.doc.002, etc.). Merging the segments back is just as easy. First, select one (or all) of the segments you want to merge in one of the panels of AB Commander. Note that you don't have to select all segments: if you select just one of them (such as Letter.doc.002 in the example above), AB Commander will be processing the segments in the correct order anyway, starting with Letter.doc.001). Now choose the Merge command from the Command menu to display the Merge window. Specify the destination folder and the base name for the merged file, and click OK. AB Commander will take each segment, one by one, and merge them to produce the original file. If the segments are located on the floppy disk, you will be prompted to insert each floppy, as required to merge the segments correctly.